Mrs. Alfred Peter Skillman Bellis - Skillman Family Association Inc.
Ida Gants Davies was born about 1883 in Pennsylvania. 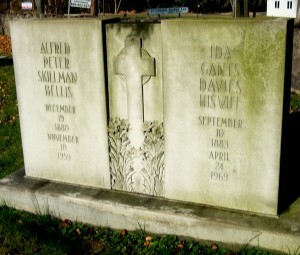 Ida Gants Davies married Alfred Peter Skillman Bellis on 16 October 1912 in Trenton, Mercer, NJ. They appeared in the census in 1930 at District 2, 514 East State St. in Hamilton, Mercer, NJ. They lived at 847 Crown St. in Morrisville, PA on 2 July 1956. Mrs. Bellis apparenty did a good deal of research on the Skillman family in the 1930s and processed them into ten compacted volumes. Shortly before her death she deposited the volumes with The New Jersey Historical Society.